Since around April time, I've been well and truly back on the tanning band wagon. I've loved a good fake tan for years now - ever since the Dove gradual tan/St Moriz days! 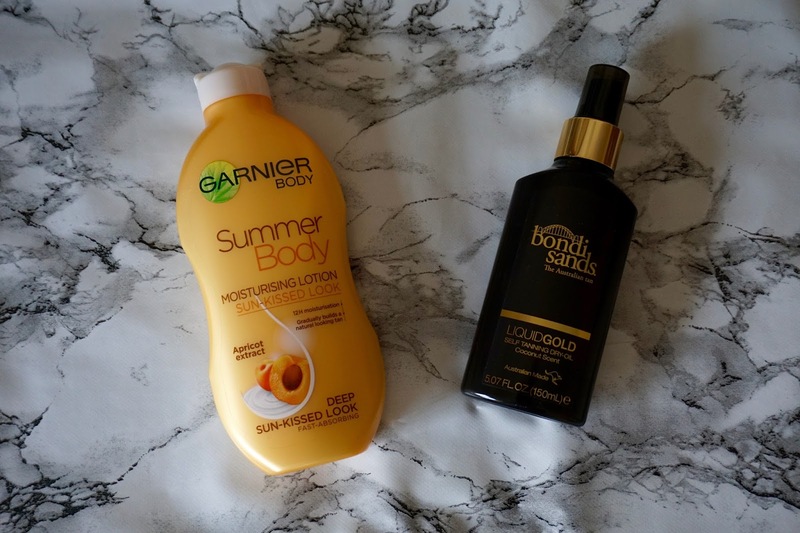 Recently, I was trying to find a good gradual tan that I can take with me on holiday in a few weeks, and the Garnier one kept popping up as a favourite. And, after Lydia Millen raving about it for weeks, I caved and got the Bondi Sands Liquid Gold too. I've been trying them out for a couple of weeks so I thought I'd do a quick first impressions of each of them. I got the Garnier one in 'Deep' (despite being super pale), because I love a good dark tan, and I knew the 'Light' variation wouldn't be enough for me. At the moment, I'm applying it with a mitt, purely because I don't know how much it sticks to my hands and at least this way I can guarantee tan-free palms! It smells of apricot, which isn't too offensive, and although it lingers, I can't say it bothered me particularly. It does definitely feel moisturising, and it sinks into the skin really quickly. I treat it as a regular body moisturiser and it definitely does the job. As for the tanning element, I have to say I really like it! Because it's a moisturiser, it doesn't stick to any dry patches or leave any patchiness at all on the skin, and it's good for building up a nice tan over 2/3 nights. I also used it to prolong a full 'guide colour' tan, and it worked well for that too. The Deep colour is perfect for me - it gave me enough colour to feel like I'd actually applied tan. I just feel if you're going to go through all the effort of shaving/exfoliating etc, you may as well make it worth it! My only gripe with this is that you can't put it on your face and it's so annoying to have a tanned body and a pale face! The second tan I've been putting to the test is Bondi Sands Liquid Gold. This is a really unique product as it's a dry oil that develops over 8 hours and doesn't need washing off. This really appealed to me, as sometimes I need to tan in a rush and not having to wash off a guide colour saves so much time (and water)! You spray it directly onto your body and rub it in with a mitt. The initial oil does have colour to it, but as you rub it in, you really can't tell where you've applied it. I thought the shininess of the oil would show, but nope, it literally disappears into your skin so you have to make sure you get every bit! I've found that by being thorough when applying, and not applying more than 1 layer, I've not had any problems with streaks at all. It doesn't dry on the body as quickly as everyone says it does, but I could get dressed fairly easily without feeling too uncomfortable, and 8 hours later I was definitely a few shades darker than I was before! I still don't get the full colour I would from a tanning mousse, but for a hassle free option, this is great. Another bonus is that it doesn't get on your clothes/bed sheets! I did use this on my face, but I didn't get as good a colour result as on my body unfortunately, but I didn't have any problems using it on my face. Possibly if you have very oily or sensitive skin, you should give it a miss on the face though. Have you tried either of these? Let me know in the comments! Also let me know if you've tried any good face tanners, I'm looking out for one to try.